I have made a trade in US Dollar futures. Long entry occurred at 5:43 am (my time), at a price of 80.43. 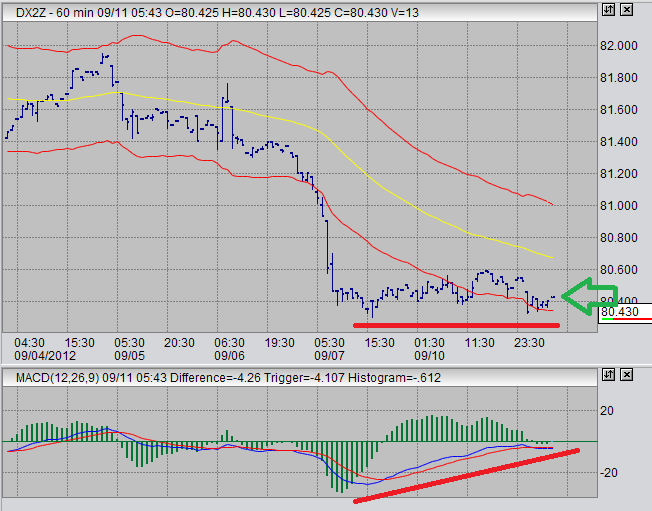 This currency futures trading is based on MACD divergence on a 60 minute trading chart. The USDX has recently undergone a sharp decline. It is conceivable that a short term correction should follow. Observer the 60 minute chart for the DX December contract. What has developed is a situation where the MACD risen quite nicely, as compared to price which has come back to recent lows. This is not a perfect MACD divergence, but I believe it is one worth trading. As usual, I am using a protective stop in case my analysis is incorrect or in case of a sudden market move against me for whatever reason. This situation is very similar to the one that occurred to me yesterday in natural gas futures. I did not make that trade because I am still familiarizing myself with that market, and so I was uncomfortable. In this market, I am a little more confident so I have less reservations about placing a trade. In other markets, I am still waiting for sugar to show an entry signal. I still feel like it is getting closer. I am waiting for gold to correct near to the weekly moving average I have set. In addition, I'm going to be keeping my eye on some of the major currencies as we approach the US federal elections occurring November 6, 2012. I suspect we will see some interesting setups forming up to that date, with the election day or near to it being a pivot point for many currency and interest rate products. It is difficult to form opinions to far in advance, but I suspect we will see short sell setups forming in currencies like the CAD, GBP, and AUD. However, this is purely wild speculation.